Garner's Dictionary of Modern Legal Usage gives authoritative guidance on all the vexing questions that legal writers face, from correcting grammatical errors to framing legal issues to distinguishing between similar but distinct legal terms. With great detail and care, Garner explains what legalese is, how it can be simplified, and how far legal writers can go in simplifying it. The topics are alphabetically arranged for ease of reference: simply look up any phrase or grammatical category you're interested in, and you're likely to find the final word on the subject. 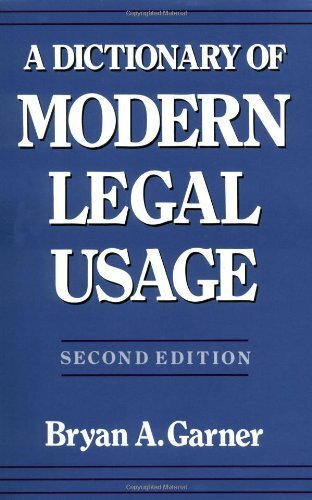 Shortly after the completion of this massively expanded second edition, the late Charles Alan Wright said: "The first edition of this book has been praised around the world as both the most reliable guide to legal usage and the most fascinating to read. The second edition outdoes even its predecessor."